The Third incarnation of the Reichstag was a short interlude, historically speaking, that came after the disaster of the First World War and the collapse of the monarchy. Known as the Weimar Republic, this German attempt to establish a true democratic republic failed for a variety of reasons, including political and economic problems – most notably a worldwide economic crisis, known in the US as the Great Depression. 1933, only four weeks after Hitler’s rise to power, on the night of February 27, the Reichstag building was almost totally destroyed in a fire of mysterious origin. The blaze gave the Nazis an excuse to put the Reichstag in limbo, citing anti-communist national security measures. On March 23, 1933 the Reichstag (meeting in the nearby Kroll Opera Building) voted to essentially put itself out of business, ceding power to the Nazi dictatorship. Although it is likely that the Nazis were responsible for the burning of the Reichstag building in 1933, they never held a parliamentary session in that structure. During the Hitler era, the few times the Reichstag convened at all, it did so in a former opera house opposite the Reichstag building. The Weinhaus Huth, with its distinctive corner cupola, was a wedge-shaped structure located in the angle between Potsdamer Straße and Linkstraße ("Left Street"), and with entrances in both streets. Wine merchant Friedrich Karl Christian Huth, whose great-grandfather had been kellermeister(cellar-master) to King Friedrich II back in 1769, had founded the firm in 1871 and taken over the former building in Potsdamer Straße on 23 March 1877. His son, the wine wholesale dealer William (“Willy”) Huth (1877–1967), took over the business in 1904 and, a few years later, commissioned the replacement of the building by a new one on the same site. Running right through the block into Linkstraße, this new Weinhaus Huth was designed by the architects Conrad Heidenreich (1873–1937) and Paul Michel(1877–1938), and opened on 2 October 1912, and contained a wine restaurant on the ground floor, and wine storage space above, so it had to take a lot of weight. It was thus given a strong steel skeleton, which would stand the building in very good stead some three decades after its completion. Famous for its fine claret, numerous members of European society were made welcome there as guests. A total of 15 chefs were employed there, and Alois Hitler, the stepbrother of the future Nazi dictator Adolf Hitler, was a waiter there in the 1920s, before he opened his own restaurant and hotel at Wittenbergplatz, in the western part of the city. Potsdamer Platz was almost completely destroyed during World War II. 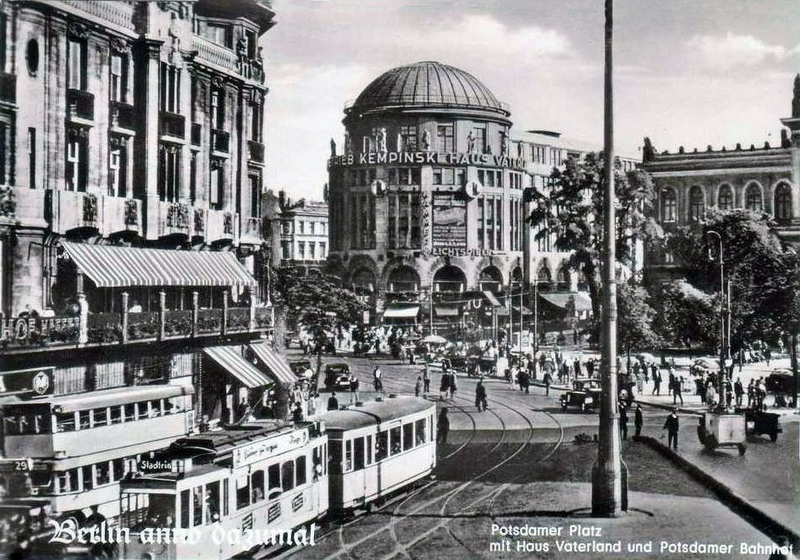 Only Weinhaus Huth and the ruins of the Hotel Esplanade were left standing in the once so lively square. When the war ended, Potsdamer Platz became the “border triangle” where the Soviet, British and American sectors met and the site of a flourishing black market. The introduction of the German Mark in the western sectors and the onset of the Berlin Blockade in June 1948, changed the picture dramatically. In August of that year, the border between the Soviet sector and the adjoining western sectors was marked with a line on the asphalt. In the expectation that Potsdamer Platz would soon be rebuilt, many buildings had been re-erected in a makeshift fashion. However, during the people’s uprising of 17th June 1953, they were burned to the ground once again. The widespread vacancy that followed combined with unresolved political circumstances turned the quarter into an uninteresting fringe area for decades. Neat discovery! And a well written thread, as always. What I also found on Wikipedia was that apparently there was a secret Gestapo prison at Potsdamer Square. Maybe Ahnenerbe had some test laboratories here as well? And I wonder what the 'Throne' will be. This is it. The heart of the Reich. We've reached the end, and Straub finds himself in a very desperate position. Keep in mind, a dog driven into a corner is the most dangerous type of dog. Apparently, the Pergamon Altar, or "throne", was brought to an air-raid shelter near the Berlin Zoo in 1941 for safety. From Google Maps, it seems like Berlin Zoo and Potsdamer Platz almost border each other, but I could be wrong. Could anyone check the distance between them? And keep in mind: An air-raid shelter near the Berlin Zoo. So how is The Shadowed Throne? Did this topic have any info that lined up with the map? Honestly don't know, I don't have the map myself. From what I've heard, many people enjoy the map, and I already browsed around if I could find discovered roadsigns or something, but I can't find anything on the internet. Perhaps someone on this forum that has bought the DLC van help.